Ye Liu, Bruce Willis, Seung-heon Song et al. 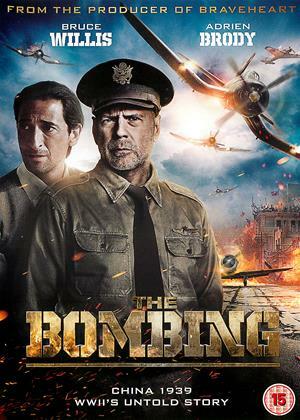 Inspired by the heroic, untold true story of Chongqing, 'The Bombing' stars screen legends Bruce Willis and Adrien Brody in an incredible tale of honour and immense bravery. This pulse-pounding war epic centres around the courage of China's citizens during WWII. As U.S. Air Force commander Jack Johnson (Willis) trains the Chinese aviators to battle Japanese fighters, a hot-headed pilot begs to fly a powerful bomber that could stop the attacks. Meanwhile, a team of spies and refugees must carry a game-changing decoder device through the war-torn countryside. 'The Bombing' portrays this historic conflict in a thrilling new light. Don’t be fooled by the posters featuring Bruce Willis and Adrien Brody. Willis makes a few brief appearances as a training officer and blink and you’ll miss Brody’s cameo. This is a Chinese film with 90% Chinese dialogue about the 1930s war with Japan. As in an old Cowboys and Indians film, all the Chinese are heroes while all the Japanese are demons. The acting is awful, the direction is staid and the cgi aerial battles are so precisely perfect it’s like watching a cartoon. An overused effect is debris flying at the camera as if it’s 3D. You’ll hate this film, especially if you’ve been fooled into watching it by the plugging of American star involvement. The whole project is a cynical disgrace. Action, yes, computer graphics excellent, and a themed running story of the destruction of Chongqing and the resilience of the local population in handling the pressure of the Japanese wanting to destroy their city. It is not a classic but once I got into it the time just seemed to fly by, helped in no way by the amazing cast of local residents and how they were coping with the bombing and at the same time being engrossed in a local MAHJONG competition. Some of the aerial graphics were excellent and whilst Bruce Willis was to the fore, there was an excellent cameo performance from Adrian Brody as a Surgeon trying his hardest to save lives with bombs falling around him. Bruce all over the DVD cover and looks like a good old fashioned war film but no. This is a rip off to get you to buy or rent it, we turned it off as could not keep up with chinese subtitles, plus was daft film anyway, we got about 40 mins in before we gave up and switched off. What has happened to Bruce Willis, first Death Wish (terrible film) and now this too, has he lost it or is he just taking the money and laughing down to the bank with it? Either way watch out from now on cos if Bruce is on the cover this is no longer a reason to rent or buy a film without thinking, in fact it probably means it's bad.